The King of Cats, Billy Herron, with another Monster Flathead Catfish caught in Stevens Creek. This Cat was 32 ½ lbs. caught over the recent holiday weekend around midnight Saturday night. Billy and Kathleen Herron, a fishing duo who fish Stevens Creek year round, also caught another 100 lbs. 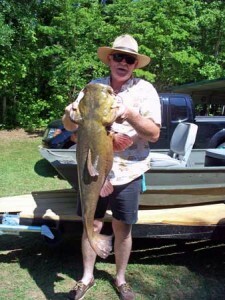 of flatheads and blues including one 18-lb blue cat. You can read Herron’s full story about fishing in Stevens Creek in the next print edition of The Edgefield Advertiser. Pick up your copy at local stores each Wednesday or subscribe today to have yours delivered to your mailbox.